2016 Baseball Address List pre-ordering! The note says, esstentially, “After 20 years of signing for FREE, I will no longer sign for free.” An autograph broker has intervened. Again. He’s taking advance orders for his 2016 Baseball Address List. The $40 postpaid pricetag is a bargain investment for any collector or researcher. Here’s one extra bit of motivation Harvey has added. The new edition will contain a growing list of 250-plus baseball names requesting fees/donations for replies. What do I glean from the “pay for replies” list? The clock is ticking, folks. Each year, more retirees may shut down their availability to us. Write to them NOW. 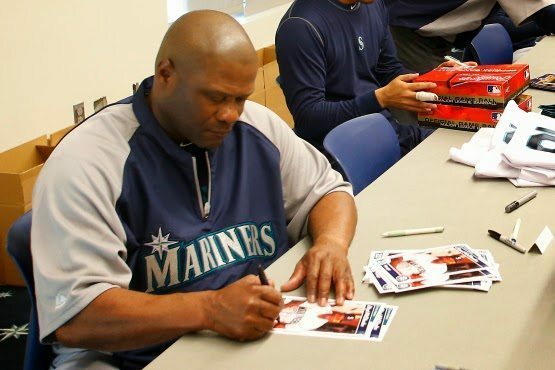 Why Would Mariners Manager Lloyd McClendon Charge For Autographs? charities in his latest autograph change, though. Address king Harvey Meiselman does a good job updating his customers about new addresses or signing changes. Here’s one that gave me a shock. A Michigan-based fan mail handler has made a deal with M’s manager Lloyd McClendon. The signing fee is $15 per card or baseball, $20 for bulky items. This isn’t a former player now dealing with wages of real-world jobs (like us). He’s remained employed as a manager or coach for years. I’d guess the autograph broker made the deal with McClendon after meeting the latter back as a hitting coach for Detroit. According to the website “Baseball Reference,” McClendon made more than $2 million in his seven-year playing career. Although MLB teams are trying to keep managerial salaries secret, numerous sources estimate that the low end of the 2014 pay scale for skippers is at the $500,000 mark. There’s no details from the McClendon go-between that part of the fee goes to charity. I’d think the Seattle front office might want to have a fast talk with their field boss. As of right now, McClendon gives the impression that he’s had to pick up a second job to make ends meet. 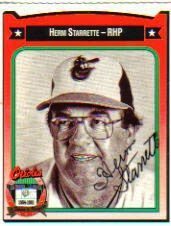 Some think of Herm Starrette as a 1960s Orioles pitcher. 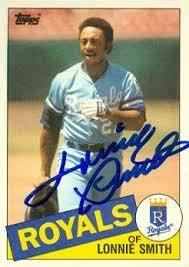 Others recall him as the pitching coach for the 1980 World Champion Philadelphia Phillies. I think of him as a fighter. Starrette, now 75, recounted his prostate cancer battle to me in a 2010 letter. Now, he’s asking for a donation per autograph: $5 minimum for cards and $10 to sign a baseball. Yes, the money will help offset his mounting medical bills. According to address list specialist Harvey Meiselman, Starrette has a 97 percent response rate. This is NOT a case of a never-signing-before name saying he’d reconsider autographs if money was added. If you’ve gotten Starrette to sign before, drop him a note of encouragement. And, while he hasn’t issued a plea for extras, I know that he’s passed out autographed cards to medical staff during his many doctor visits. Starrette has been giving for years. He seems entitled to ask for support versus his biggest foe yet. Let’s keep him in the game.